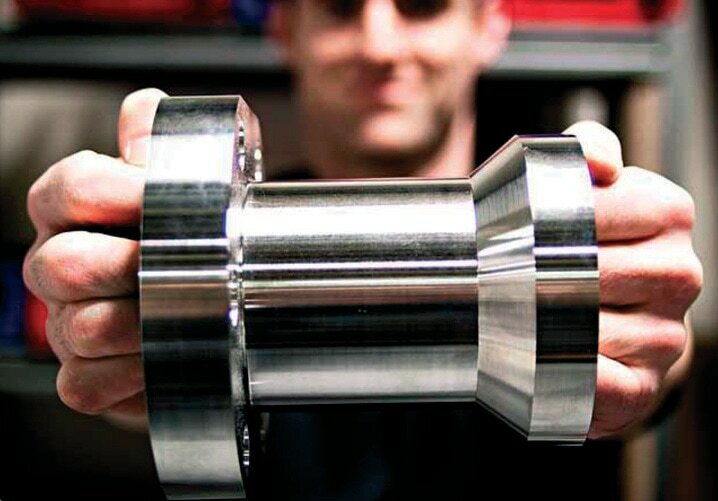 ​Located in the foothills of the Wasatch Mountain Range in Ogden, Utah, you will find a superior machine company called Quick Turn Precision Machining. The company is a full service machine shop specializing in small to medium rapid turnaround precision machine work -- from custom tooling and intricate molds to small-specialized parts. In addition to state-of-the-art CNC milling, turning and water-jet cutting, the company also provides heat-treating, sandblasting, welding, fabrication, and technical drawing to meet all your needs. Quick Turn Precision Machining founders/brothers Nate and Adam Woods knew that they had a passion for precision manufacturing from an early age. Shortly after high school, the two studied precision machining at the Ogden Applied Technical Center (OATC). After graduating from OATC, Nate and Adam each spent years working for other companies in the manufacturing industry, and Nate is particularly grateful for the formal apprenticeship experience he received from Autoliv, his previous employer. ​16 years ago, the brothers founded Quick Turn Precision Machining to provide for the growing needs of quality, rapid turn around, high quality machined parts. Since 1997 Nate and Adam have been steadily building a highly reputable standout business. They love to make things - and make the well - and it shows in every facet of their business. Nate continues to direct and lead the company, and the experience and education of building Quick Turn has only increased his love for his trade, and the team he has put together. Today, Quick Turn's customers span the defense, aerospace, engineering, automotive, recreational and automation industries, and while most of their work is done for local customers, through referrals from their customers, they now have customers throughout the Western United States. Adam says, "We Have customers who are a start-up company designing a new product, and we'll make 1 or 2 prototypes for them, and then we have customers who are publicly held, with sales in the billions. We are dedicated to providing superior customer support and end products to both ends of the spectrum." ​Recently, a team from Universal Studios audited them. Based upon a very successful audit, Quick Turn was one of very few shops in the country that will build products for Set Point Engineering, who specializes in the amusement park industry. Quick Turn’s products will eventually be an integral part of the rides you might take your children or grandchildren on at Universal Studios. ​The company employs 20 machinists today, many who have been with Quick Turn for a decade. They additionally hire young, new machinists, and Adam spends the time needed to mentor these young machinists. Nate says, “We train every one of our employees to become journeymen machinists.” At Quick Turn, everyone can program and make parts, including Nate and Adam, who admit they are very hands on, and still enjoy making parts. Nate says, “We don’t just have operators.” With a solid backlog early into this year, Nate and Adam recently added a swing shift to accommodate their customers. ​Adam says, “We evaluated premium high precision machines from a few different builders, and ultimately, we chose Mazak. That was 3 years ago, and since then, we are equipped with 5 Mazak machines.” The company has 4 Mazak turning centers and a Mazak mill. Just months ago, Quick Turn purchased their first true 4th axis. ​What else do they like about the Mazak machines? Nate and Adam value the user friendly Mazak controls, and they really like that Mazak is one of the few machine tool builders that are making machines in the USA. Space is at a premium at Quick Turn Precision Machining. The brothers expect that they will soon have to move to a larger facility. One of their latest machine tool purchases, the Mazak Vertical Center Smart 530C was perfect for a crowded shop. It is a compact, highly productive machine that provides unsurpassed performance and value for a variety of applications requiring heavy-duty machining, high-speed machining or both. Quick Turn’s latest Mazak machine purchase was the Quick Turn NEXUS250-11MSY. It is a fitting machine tool name for Quick Turn Precision! Nate says this machine brings together advanced technology, productivity and value to deliver exceptional performance for his shop. It offers multi-tasking capability with milling and turning in single part setups. Power and speed is increased in virtually every category. Plus, the machine comes equipped with the Matrix CNC control, featuring simple, smart conversational programming, complete with monitoring and diagnostics. Quick Turn just purchased the FARO Edge, an advanced measurement tool. The Edge allows Quick Turn to easily verify their product quality by performing inspections, tool certifications, CAD-to-part analysis, and reverse engineering. It is just another step Quick Turn took to support its customers. "We go out of our way to use Quick Turn, for a number of reasons. One of the most important is their service -- it is just so over the top. We started using them about 10 years ago, and they make various smaller machined components for us. Their pricing is very competitive and their flexibility and customer service is outstanding. We often come to Quick Turn with incredibly rapid turn projects, and they make things happen in a heartbeat. Another thing we value in Quick Turn is that their equipment is top of the line. They make an effort to stay ahead of the technology curve, and this really helps us. Quick Turn is just outstanding." "Quick Turn's service is amazing! Their pricing is very reasonable, often lower than other bids we get. I think they can offer superior pricing because they manage the shop very well, and they turn the parts around so quickly. They alsokeep a very clean shop, which is clearly a reflection of their pride in producing perfect parts. Quality at Quick Turn is really, really good, and they always meet the tight tolerances we require for our aerospace parts. Quick Turn makes all types of aluminum tooling and fixturing for us. The team at Quick Turn forms a great relationship with its customers. We work closely with Jeff, and he drops in every few weeks just to make sure things are going well. We are so pleased to be working with this excellent company!" “I give Quick Turn an 'A' grade. We've been using them for 3 or 4 years now. They make plastic and aluminum subassemblies for us. We continue to use them because their quality, pricing and turnaround are all very good. When we need them on a rush job, they are always there for us. The team at Quick Turn is very competent, and we willcontinue to do business with them. Let's say they are on our Christmas list for 2013"
​call them at (801) 334-6800 or visit their website at quickturnmach.com.